The engine and the future | What Car? 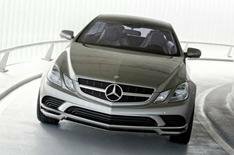 Power is provided by a 204bhp 2.2-litre diesel engine that is set to power future E-Class Coupe models. The engine features special technology to lower emissions, which Mercedes calls Bluetec and Adblue. However, no emissions figures have been released for the concept car. Officially, Mercedes says Concept Fascination has been created to give designers the opportunity to try out unconventional ideas and gauge public reaction to them. However, if the design meets widespread approval, it is likely to go on sale in modified form from 2009.